We all know the Real Estate market has cycles. Each part of the cycle has its unique opportunities and challenges. Back in 2010, it was easy to find good Contractors. Homeowners were getting foreclosed on in mass. Very few people were remodeling their homes. Banks were not lending, so new construction screeched to a halt. Contractors were hungry and were willing to do work at very low margins just to stay in business. Unfortunately, things were so slow, a lot of folks went out of business. We all know what happened next - the economy turned around, population grew, and we found ourselves with a shortage of housing. The Contractor base had shrunk and was unable to meet the surging housing demand. Home prices and rents went up as Demand outstripped Supply. Suddenly the Contractors who were searching for business a few years earlier were overwhelmed with customers. Contractors who had little pricing power in 2010 now had considerable pricing power. Established Contractors quickly were overwhelmed with large backlogs of business. Provide tips on how smart Investors research and background check their Contractors. Discuss how to work with and get the most from your Contractors. 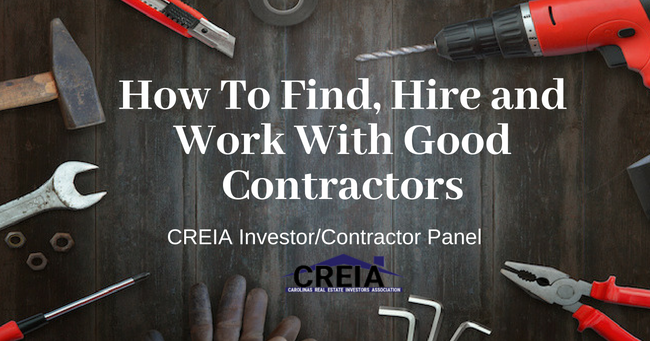 Share what good Contractors are looking for when they are deciding on who they want to work with. We have all heard the horror stories that result from bad Contractors. Come out to this month's main meeting and find out how you can improve your odds of building strong relationships with the good ones.